Brightpearl have teamed up with Mailchimp to provide an integrated email marketing service. With this Brightpearl App, contacts and segmentation are managed in Brightpearl and automatically synchronized with Mailchimp mailing lists and interest groups. The email campaigns sent from Mailchimp will be recorded on the contact timeline in Brightpearl allowing you to see a full history of communications. When using Mailchimp’s premium feature Ecommerce360, order data collected in Brightpearl will be sent to Mailchimp for reporting on visitors drawn from campaigns and the purchases they made. 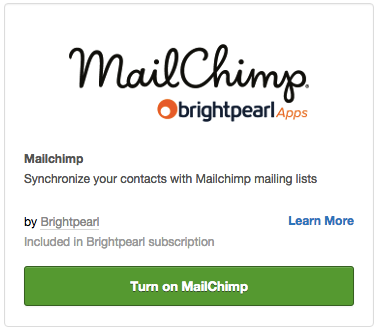 The Mailchimp app is activated within the Brightpearl App Store. Once the app has been added to your account you will find the settings menu added at Settings > Brightpearl apps > Mailchimp from where the app is connected and configured. Contacts are uploaded to Mailchimp from Brightpearl when they are assigned a Brightpearl Tag which is mapped to a Mailchimp List, and when the contact's 'Receive email newsletters' is set to Yes. 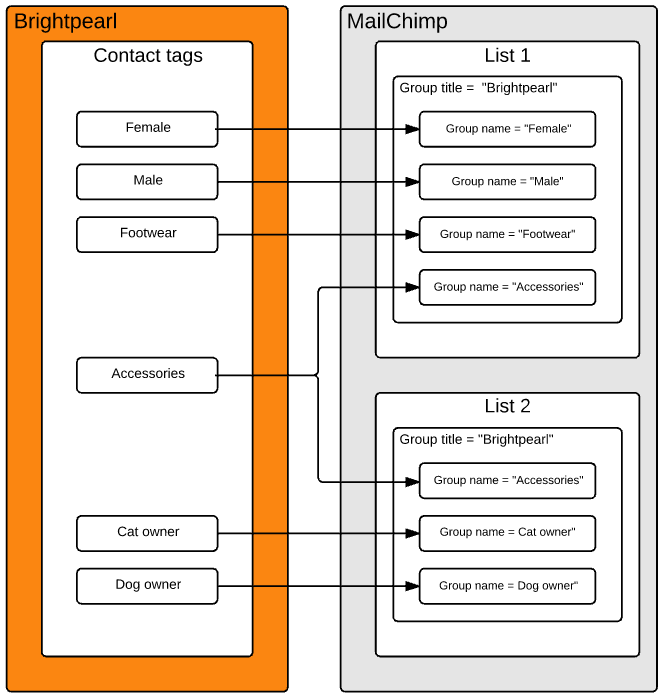 Upon saving the tag mapping Brightpearl will synchronize with the Mailchimp list looking for groups with the same name as the tags, and where no match is found a new group is created. This means that all the mapped tags exist as a group on the list, without any duplicates. Note that any existing groups on the Mailchimp list will not download into Brightpearl. Tags will only attempt to connect with group names which are within a single group title of "Brightpearl". If this group title doesn't exist for the list when the sync occurs, the app will create the group title and all the tags as new group names, regardless of whether a group of the same name exists under a different group title. 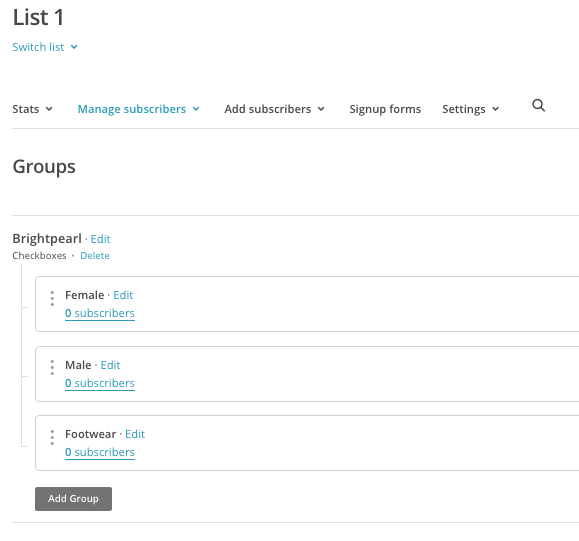 When connecting a Mailchimp account which already contains groups, it is possible to rename one title on each list to "Brightpearl" so that those group names can be used. A group name added directly in Mailchimp will not download into Brightpearl. When this occurs, a tag will need to be manually created in Brightpearl and then mapped to the relevant Mailchimp list within the app settings. Note that the group must be added under the group title of "Brightpearl". They must be set to receive email newsletters. This setting is found on the customer/supplier record and can also be updated via the customer/supplier import or batch processing on the customer/supplier list. The contact will be added to the relevant Mailchimp list and assigned to the group with the same name as the tag. If no group of the same name is found, it will be created in Mailchimp as part of the sync. A single tag can be mapped to multiples lists, in which case the contact will be added to each list once and assigned the group from each list. A contact can be assigned multiple tags which are mapped to Mailchimp. The contact will be added to a list once and assigned to each group. Contact details will be kept in sync between Brightpearl and Mailchimp by looking for a matching email address every time a contact is saved in Brightpearl. 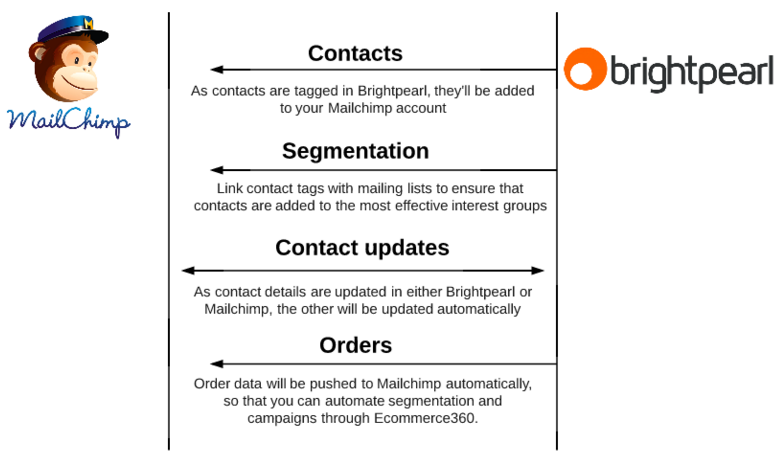 If a contact is amended in Brightpearl the matching record will be updated in Mailchimp. If a contact is amended in Mailchimp the matching record will be updated in Brightpearl only if the option has been activated on the app settings at Settings > Brightpearl apps > Mailchimp . When active, each time a profile is saved in Mailchimp the app will look for a contact with the same email address in Brightpearl to update. If an email address is edited in either system this will cause the contacts to no longer match and to be treated as a new contact. This means that a new contact will be created in Mailchimp with the new email address. A contact which is deleted in Brightpearl, or removed by merging it into another contact, will not be removed in Mailchimp. If this happens, you will need to manually unsubscribe or remove the contact directly within Mailchimp. Alternatively, you can first untag the contact in Brightpearl, which will update Mailchimp, and then delete them or remove them by merging into another Brightpearl contact. Contacts which are uploaded to Mailchimp from Brightpearl will receive a double-opt in email if specified in the below setting. With this set to Yes, the contact will be set to a pending state until they click the link in the email confirming their subscription to the mailing list. Find our more about double opt-in here. If a tag, which is mapped to Mailchimp, is removed from the contact in Brightpearl then the person will also be removed from the group in Mailchimp. If the contact has other tags which are mapped to the same Mailchimp list then they will remain subscribed to the list and in those groups. Whilst the contact remains on the list the contact can be added and removed from the groups using Brightpearl tags. However, if the contact is removed from all groups on the list then they will be entirely deleted from the list. If a contact is assigned a tag after they have been deleted by Brightpearl then they will be resubscribed. But if the contact is assigned a tag after they have been unsubscribed via Mailchimp admin or a Mailchimp email then they cannot be added again from Brightpearl. If a contact wishes to resubscribe it must be done from Mailchimp using their confirmation processes which ensure that this person wishes to be resubscribed. Learn more about how a contact can resubscribe in the Mailchimp knowledge base . If a contact is unsubscribed through Mailchimp the contact will be removed from the list but can bee seen on the unsubscribed list. If you would also like the tags to be removed in Brightpearl this must be activated within the app settings. If this is activated later, after a contact has already unsubscribed, the tag will not be removed. When a tag is automatically removed due to an unsubscribe notification from Mailchimp, a note will be added to the contact timeline. If the tag removal was not successful, this will be indicated within the note on the contact timeline and the removal will need to be completed manually. eCommerce360 is a Mailchimp feature that allows order data to be recorded for contacts. On the premium version of the feature, order data is used to automate segmentation of contacts. Order sync must be activated on the app settings at Settings > Brightpearl Apps > Mailchimp, and one or more sales statuses must be chosen to sync. If an order is not uploaded due to the contact not having a mapped tag, or the order not having a channel, the upload can be retried by ensuring those things are done, and then switching the order off the status and back onto the sync status. What happens if a group name is edited in Mailchimp? Editing a group name in Mailchimp will not update the matching tag in Brightpearl. If the group name is edited it will no longer match the Brightpearl tag name, and this means that when the next sync occurs (either by saving the settings or by tagging a contact) Brightpearl will not find a matching group and will therefore create a new group using the tag name. What happens if a tag name is edited in Brightpearl? Editing a tag name in Brightpearl will not update the matching group name in Mailchimp. If the tag name is edited it will no longer match the Mailchimp group name, this means that when the next sync occurs (either by saving the settings or by tagging a contact) Brightpearl will not find a matching group and will therefore create a new group using the new tag name. The old group will remain in Mailchimp with the original name and a new group will exist with the new tag name.